Detroit, MI – During Super Bowl week, columnist and author Mitch Albom made a plea to metro Detroiters not to forget the homeless. He spent a night in a homeless shelter to bring attention to the problem. He pointed out that special funding and “parties” had been arranged to keep the homeless occupied – and off the streets – during Super Bowl week, but that once the Super Bowl was over, they would “be returned to the same old difficult existence.”On February 7, 2006, Albom announced that his “S.A.Y. Detroit” – standing for “Super All Year Detroit,” rather than Super on one weekend, had experienced extreme success. 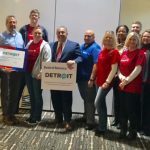 The article resulted in more than $310,000 being raised, including a $10,000 contribution from the Detroit Pistons and the Pistons-Palace Foundation. Those in attendance at the announcement included Detroit Mayor Kwame Kilpatrick, Palace Sports and Entertainment President and CEO Tom Wilson, Tim Pendell from the Detroit Lions Community Relations Department, beneficiaries of the funds raised Chad Audi, CEO of Detroit Rescue Mission Ministries, Brother Jerry Smith, Executive Director or Capuchin Soup Kitchen, Sheila Clay from NSO, Sheryl Johnson, CEO of C.O.T.S. (Coalition on Temporary Shelter) and Faith Fowler from Cass Community Social Services. Mayor Kilpatrick made the point that anyone could be homeless and in a position of need at any given time. “But for one minor event, one minor moment in one’s life, our places could be traded,” he said. Homeless man Duane Malone, who has been recently staying at Detroit Rescue Mission, where Albom spent the night during Super Bowl Week, kicked off the ceremony. “I heard stories from men and women older than me, younger than me, smarter than me, but who didn’t have the same opportunities as me,” said Albom about his experience staying overnight at the shelter. “We are very thankful to now be able to make sure we serve milk at every meal at Capuchin,” said Brother Jerry Smith. Concerned citizens from as far away as Ireland and the United Arab Emirates heard about the situation in Detroit and made contributions. Albom had originally sought $60,000 to help run the DRMM 24 hours a day through the winter, as well as procure a 24 hour van, a mental health professional, and additional beds. The generosity of Detroiters and others has already far exceeded Albom’s original request. With the money raised, C.O.T.S open a daycare center for infant children of their homeless clients. 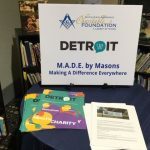 Albom and DRMM will announce a new “One Homeless Night” program, in which metro Detroiters will be invited to spend a night at either a men’s or women’s shelter, as Albom did, to understand and interact with our homeless population. 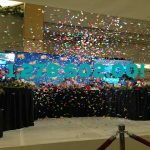 Also, the city will be able to hire a social worker to help the homeless population get back on their feet, dealing with their long term and short term problems to help provide them opportunities for a better life in the long run. Shield’s Pizza, which was moved by Albom’s column, will be designating one pizza per day at its stores, from which proceeds will be given to S.A.Y. all year long.